The kids were real troopers and also had a blast. The even had also set up kids activities and bouncy castles. Alessi got a lot of "Awws" walking around in her lady bug raincoat. Alex completed her first running event! 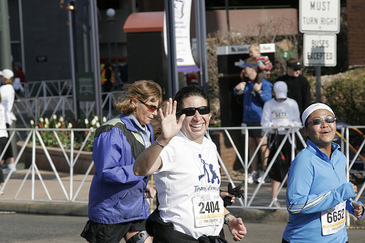 Congrats to Alex for finishing her first running event, the 2008 Cherry Creek Sneak 5k! We are so proud of you! Big thanks to the kids for getting up early and for Rica for coming out to cheer Alex on! This past weekend was the perfect example of why Denver weather is never boring. Saturday was beautiful with a high of 80 degrees. The kids and I enjoyed playing on the new church playground with friends while the dads painted the church nursery. That night when Marcus and I went to our parish Dinner Club at 7pm, the car thermometer said it was still 70 degrees. But by the time we left at 11:30, it was down to a very chilly 40 degrees and rainy. 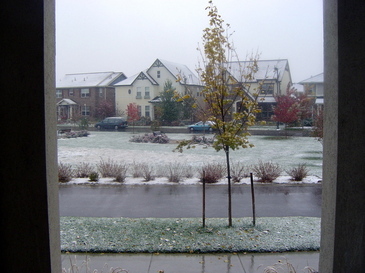 Then the next morning we awoke to our first snow of the season - a wet, heavy three inches. The kids loved playing in it! Here are some of the pics at the end of our October 2007 album. By the afternoon, it started clearing up and we saw the sun, and now of course now we are headed back into the nice 60s and 70s this week. The weather should be great for the World Series here in Denver this upcoming weekend! Go Rockies! We had great weather here in Denver this weekend. Sunny and 65-75 degrees (a dry 65-75). 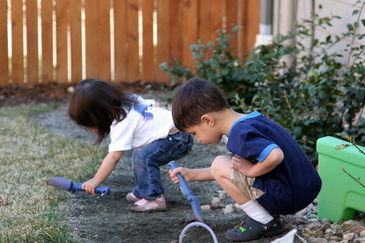 The kids have taken every opportunity to play in the backyard and dig up our gravel walkway. Yesterday, we took the training wheels off Paola's bike for a bit so she could practice bike riding. She did great and I think that in a couple more sessions, she could be off training wheels for good. I had flashes of teaching her to drive... and had to re-evaluate my teaching method when she said, "Dad, you're being too hard on me." Yeah, ouch. Afterwards, we put the training wheels back on and we all rode to Town Center for lunch. Stephen and Jenny drove in on the 27th with their kids, and were promptly greeted by another blizzard here in Denver. We spent the morning at Denver's Museum of Nature and Science, by the time we were done there at 11, it was snowing. 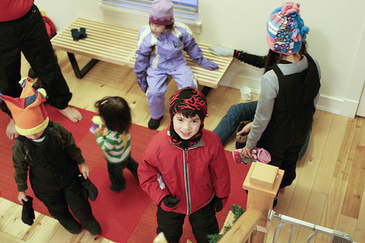 Plans to go up to the mountains didn't work out, but the kids suited up anyway to go sledding in the park. is that the next day after a blizzard, it's gonna be sunny and gorgeous. Thought I'd post the process for turning off and draining our sprinklers so I have it handy for next year. Things you need: a bucket to hold about 3 cups of water and a flathead screwdriver. Step 1: Open the valves of the pipes to 90 degrees using the flathead screwdriver. Water will start spewing out. Quickly run downstairs to the basement. Step 2: Turn off the water going outside of the house. This should stop the water from spewing outside. Step 3: Open the screw valve, holding the bucket underneath to catch the water that was in the pipes. Step 4: Turn the blue valves to 45 degrees and the screws from step 1 to 45 degrees. This will prevent any pressure from building up and allow any moisture to escape. Step 5: Open the valve in the sprinkler box closest to the pipes and allow any water to drain out that is in the sprinkler system. If you do this early enough in the year, the water in the sprinkler system should evaporate before a hard freeze, and you shouldn't have to have them blown out. So...last week started off with a limp....Monday evening, I sprained my ankle at the gym. I wish it had been during glamorous like some sort of death move while doing krav maga, but I simply rolled it while getting off of a machine. I was in a lot of pain, hobbled to see Kobe and Paola at their first day of school, Alex dropped me at the doctor tuesday morning, they wanted it x-rayed to rule out fracture. Turns out it was 'just' a bad sprain, and they gave me a huge black boot of straps and velcro to wear. My boss calls me Thumper. Then the breakup. I think it was Tuesday night, I was eating some crackers in front of the tv, icing my ankle, as Alex picked up my slack, and CRUNCH. I've split a crown that was recently put in. Yeah, on a cracker. I had already had a root canal, so I didn't feel any additional pain. The next morning I made an appt on Friday to get the crown refitted. Side note: why is there no money-back or satisfaction guarantee with dentists and doctors? As if that isn't already an earful...heh, Thursday morning, like early, like 4:30 in the morning, I'm waking up with pain, in my ear. By the time we wake up around 7, it's really painful. By 8, persistent, like MI3 someone has implanted a capsule in my head and it's about to blow. I call National Jewish -- best allergy research facility in the country -- by 8:30. Thank God they can see me in the day clinic at 9. They make me go through the whole routine that makes them the best allergy research facility in the country filling out paper work, making me blow in the breath meter to make sure i haven't contracted asthma, taking bp, blood ox. I'm hurting. Finally usher me into the nurse practitioner. She's shuffling papers, lecturing me on taking my allergy medicines consistently, what do i see come out of my nose when I use the saline spray, I pinch myself, it's all I can do to scream that I'm hurting! She get's it, says that there's an ENT in the next office and will be right back. She's back quickly, i'm ushered into the office literally right next door, there's 3 or 4 nurses in there with the Dr. He's a fast talker, thank goodness. He spins me around in a chair and points me to a video monitor, puts a scope, one with a light and the camera on it into my ear that's fine, then into the other ear that hurts, it's completely different, closed off, red, gross. Acute ear infection he says. Rare in adults. I've never had one in my life before. He takes pictures, prints them out. I'm going to blog them, but the nurses asked if they could have them for educational purposes. He says heavy anti-biotics. It's going to hurt, but you should feel better in a couple of days, lots of pus and it will take a while for you to be able to hear in that ear, he says. He was mostly right, seems like it's hurt every day in the late afternoon. I've probably had my limit of motrin and tylenol and aleve for the next couple of years. Finally, the slow drip of pus has stopped 4 days later. Huge thank you to Alex for taking care of a 4th kid through all of this, nursing me back to health. Otherwise the weekend was good. 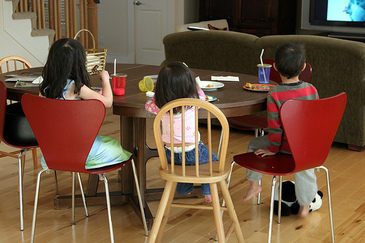 I wish I had been able to run around with the kids outside... but I think i'll be taking baby steps first. Photos of the kids using the iPad keep showing up all over the web. Alex Kwan on Alex's 2009 Colorado Colfax Half Marathon Run! trip on Day 1 of catered salads at work!